Charles A. “Chuck” Donovan, Nora Sullivan, M.P.A | December 1, 2012. National and state abortion reporting laws and policies in the United States are a patchwork that falls far short of fulfilling the potential of this information to inform and guide public policy. The composite picture they reveal is at once impressionistic and incomplete, non-contemporaneous and of limited use in providing a true and timely rendering of the impact of public policies and attitudes on the reality of abortion in the United States. Like an observer of the night sky, analysts seeking to understand the real-time status of abortion in the United States are forced to look at sketchy and incomplete information whose origin, like light from the stars, varies by age and quality. In this era of Internet technology and nearly instant reporting of all sorts of data, this patchwork need not be the rule, nor need policymakers accept such incomplete information as a given. Moreover, policymakers can and must be aware of the biases inherent in the current system of gathering and disseminating data about one of the most morally fraught questions in public life. Getting current and unfiltered information and having the advantage of multiple interpretations of its meaning should be a topic of the highest priority for state and federal attention. Moreover, in the age of the Internet, neither gathering nor disseminating useful, current, and patient-protective cumulative data need be a costly enterprise. Consider the example of Minnesota. Abortion reporting there is conducted on a relatively timely basis and at low cost to the state treasury. While some states with large numbers of abortions – for example, California and Maryland – have not produced a public, statewide abortion report in years or do not publish one at all, Minnesota’s Department of Health implements a state law passed in 1998 that requires it to release a compilation of data for the previous calendar year by July 1 of the following year (see http://www.health.state.mn.us/divs/chs/abrpt/abrpt.htm). These reports allow the state legislature and interested citizens to track and analyze state abortion trends and document decreases in abortion, presumptively a consensus objective in public policy. The 2011 annual report states that its production cost, including printing and staff time, was only $4,000 in 2012. Across the spectrum of views about the legal status of abortion throughout the duration of pregnancy, a wide range of commentators have urged public policies that would render the practice rare. An examination of state and federal reporting policies makes clear, nonetheless, that the system now in place is poorly suited to determine whether or not, in fact, abortion is becoming significantly less frequent and to what degree, especially in year-over-year comparisons where published data is delayed, non-existent, or available only from a single source with a history of close ties to the industry itself. Uniformity of data across the states is severely lacking, as is the completeness of information even regarding such elementary questions as the potential shift underway between surgical abortions and chemically induced procedures. Moreover, the laws generally take little advantage of advances in the ease and timeliness of reporting that are offered by the development of the Internet. While a few states have adopted legislation that facilitates and encourages the compilation of flash reports on basic abortion data within their jurisdictions, the vast majority of states deploy longer timelines to obtain information that would be of great value to policy makers in assessing the short- and long-term impacts of other state laws regarding abortion or even of wider trends in the economy or cultural factors that may be influencing the recourse to abortion. Changes in public policy on abortion reporting could ameliorate this situation without massive cost to taxpayers and with continued regard for individual medical privacy, an area in which legitimate concerns exist regarding inadvertent release of sensitive patient information. First, a word about national abortion reporting. Since 1969, four years before the Supreme Court legalized abortion nationwide, the U.S. Centers for Disease Control (CDC) have published an annual report on the incidence of abortion in the United States. This report is based on data submitted by the majority, but by no means all, of the political jurisdictions in the United States. In 2009, for example – the most recent year for which CDC has published a report – CDC requested abortion reports from 52 jurisdictions, that is, the 50 states, the District of Columbia, and New York City. Forty-eight of these jurisdictions provided data to the CDC (one fewer than 2008), but only 45 of them have consistently done so since 1999, restricting the trend analysis CDC is able to perform. The submission of these reports by the states, D.C., and New York City is completely voluntary. by since 1999, it remains substantial at nearly 32%, a figure virtually unchanged since 2003. 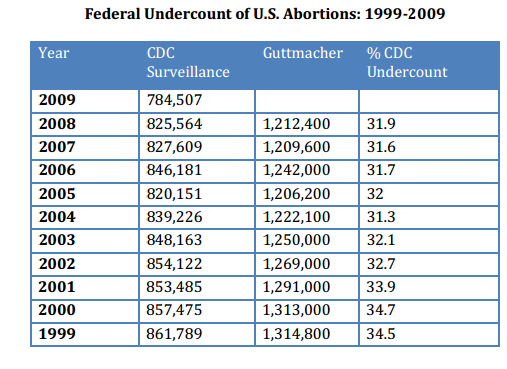 Compare this to the U.S. Census net over count for 2000, which is estimated at 0.5%, and to CDC-Guttmacher abortion count differentials in the 1990s, which were as low as 13%. With the exception of several jurisdictions described below that have sharply increased the quality and speed of their abortion reporting, the amount of progress made in providing better information about abortion and women’s health over the past 15 years is startlingly small. Some locales have even seen sharp diminutions in the completeness and reliability of their information. A useful special report on the federal and state roles in abortion reporting published in 1998 (Saul), stemming from the debate over partial-birth abortion and questions about the prevalence of late-term abortion in the United States, found that “the quality of CDC’s information is primarily compromised by the unevenness of reporting in the states.” At the time of the special report, for example, only 17 states had moved to include non-surgical (medical) abortions as specifically reportable events in their reporting process; today, according to the current study, the number is at least 38, leaving perhaps a quarter of the jurisdictions without mandatory tracking of this growing phenomenon. The last significant attempt at the federal level to produce more uniform and useful information about abortion was abandoned by the National Center for Health Statistics (NCHS) nearly two decades ago. The NCHS attempted to move from the states’ aggregate abortion reporting to a system of contracts that would have relied on the NCHS’s U.S. Standard Report of Induced Termination of Pregnancy. The maximum number of states adopting the standard report was only 15 and the effort ended in 1993 due to a lack of adequate funding and, one may infer, flagging federal commitment to data collection, a continuing concern with respect to other social indicators at the national level. The remainder of this report is devoted to a fresh look at state abortion reporting policies, with special attention to recent steps that several states have taken to improve their data collection and dissemination, and to provide recommendations for state and federal policy changes to extend these improvements as a way of monitoring, among other questions, whether, and why, abortion is becoming more or less rare in the United States. In November 2011, we began gathering information about abortion reporting data for each of the 50 states, the District of Columbia and New York City. The abortion reporting forms, also known as Reports of Induced Abortions or Reports of Induced Terminations of Pregnancy (ITOPs), are completed by the abortion provider or a representative of the abortion-providing facility. The forms supply general data about the patient, the procedure, and the facility for statistical purposes. Certain states also require additional information regarding the developing child, complications due to the abortion procedure, the abortion provider, as well as various additional areas of interest. The abortion-providing facility collects the data and sends it into the state at regular intervals. Most of the states use this information to produce an annual report, and most states make these reports available to the public at a regular if often delayed basis. The state then has the option to send the aggregate report to the CDC for compilation in its annual report to the nation, which is typically published up to three years after the close of the calendar year covered by the state reports. We commenced the collection of data by researching the web sites of each state or jurisdiction’s Health Department, Office of Health Statistics, or Office of Vital Records to see if the state’s abortion reporting form and annual reports were readily available online. After locating several online, we began an effort at information collection via telephone and e-mail. While wading through public offices was often a slow process, this method proved much more effective. The official responsible for abortion reporting was asked for a copy of the state’s abortion reporting form as well as the state’s most recent abortion report or abortion statistics. We were able to obtain information from the vast majority of states. While seven states (Montana, Rhode Island, California, Wyoming, New York, Pennsylvania and Hawaii) indicated they will not release their abortion reporting forms to non-abortion providers, others (such as New Hampshire and Maryland) simply do not collect abortion data at all. The abortion reporting forms were then examined and categorized across common elements on a set of spreadsheets so that each state could be compared. The categories analyzed for each state were: 1) The general features of abortion reporting laws; 2) characteristics of mother; 3) characteristics of the pregnancy/developing child; 4) doctor and physician Information. Arraying the information in this way allowed for the comparison of state policies across a wide variety of factors affecting where abortions are performed, when in pregnancy they are done, who is having abortions in the United States, and what we do and do not know about this medical procedure. Overall, our research tallied nearly 40 discrete data points that the states inquire about or that typify the laws and policies governing this information collection. The variation among the jurisdictions is significant, with a handful gathering little or no information at all. A few jurisdictions gather very detailed information that allows evaluation of abortion incidence even by zip code, although most jurisdictions restrict their published information to statewide or county-by-county tallies. 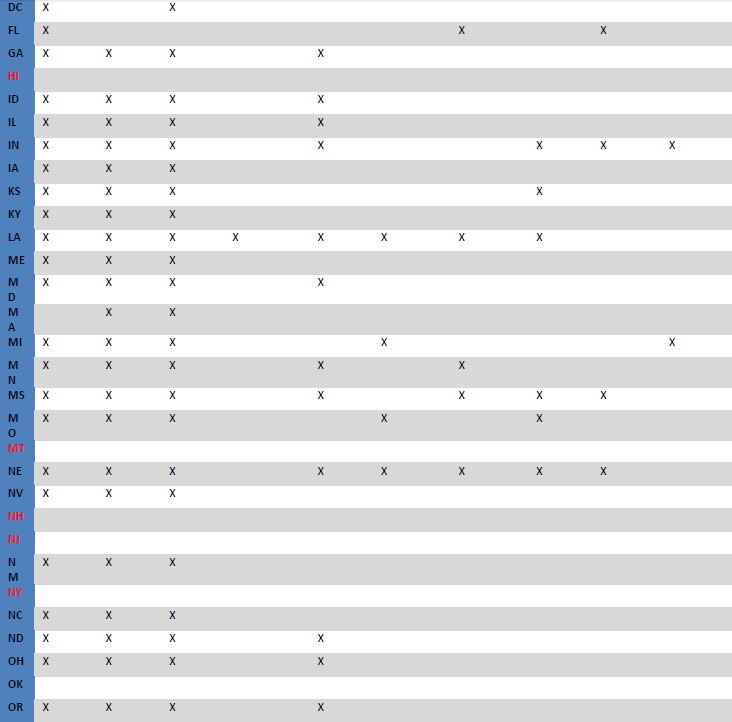 Data in Tables 2 and 4-6 is current through April 2012. 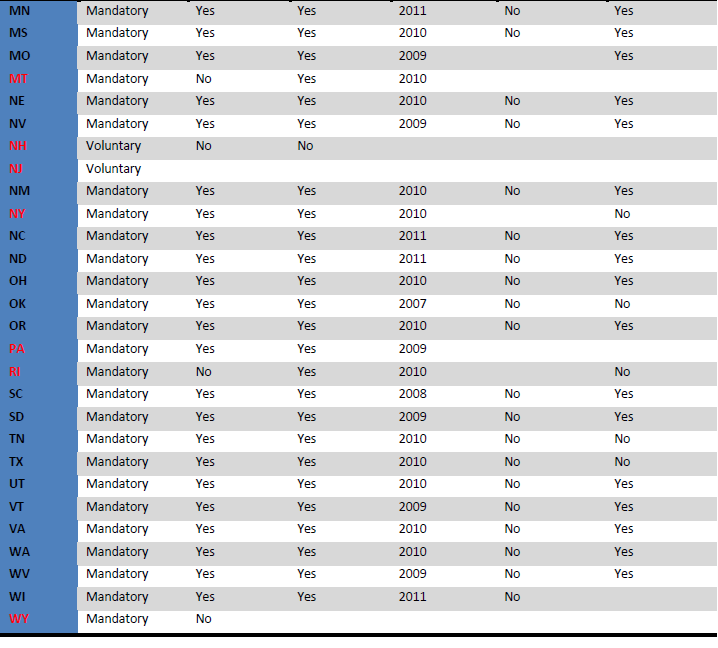 Turning first to the general features of state laws and policies (Table 2), the number of states that have mandatory reporting policies has grown slightly since 1998, when mandatory reporting was already widespread but not universal. In 1998, 36 states had mandatory reporting laws, three mandated reports via regulatory policy, and six jurisdictions (five states plus the District of Columbia) had voluntary reporting policies. Arizona, in particular, moved in 2010 from a regulatory policy on abortion data collection to one of the more useful and effective statutory schemes. Jurisdictions that continue to make abortion reporting voluntary include, however, several that report some of the highest abortion rates in the United States, significantly affecting the quality and utility of national abortion data through public sources. These jurisdictions are California, the District of Columbia, Maryland, New Jersey, and New Hampshire. Most of these states rank among the top ten nationally in their abortion rates: California (6th), the District of Columbia (4th), Maryland (5th), New Jersey (3rd), and New Hampshire (31st-tie). States also vary considerably in the amount and timeliness of information they make available to the public. Concerns about the potential risks of retaliation against abortion providers or violation of the medical privacy of women obtaining abortions have played a role in debates over the scope and specificity of abortion reporting. Measures to protect the privacy of patients are invariably included in state abortion reporting laws, and the constitutionality of statutes including mandatory reporting provisions without identifiers has been repeatedly upheld by the U.S. Supreme Court. More attention has been and should be given to increasing the accuracy and completeness of abortion reporting, reducing the cost of collecting and publishing the information, making it accessible to the public through venues like the Internet, and pointing the way toward cross-state comparability and consistency. These goals are achievable without compromising protection of private medical information. Our survey touched upon use of the Internet and the speed of publication of both annual and, less often, month-over-month data on abortion, a particularly significant development that could assist both private and public entities in designing and evaluating laws and educational campaigns to reduce the incidence of abortion. Forty-four of the 50 states compile and publish annual reports providing an array of information, most commonly the total number of abortions, the gestational age of the developing child, the number of previous abortions, the abortion method, and the provider type. The six states that publish no annual reports again include some with the highest abortions rates in the country (California, New Jersey, Connecticut, and Maryland). New Hampshire, with a low abortion rate according to privately compiled data, is reviewing its abortion-data policies and has set up a legislative study committee to review its current policy. Massachusetts and Florida collect data and will provide raw information on request but publish no reports. The District of Columbia publishes an annual report, and New York City publishes one of the nation’s most comprehensive annual reports on a relatively swift timetable. As noted above, the CDC and the Guttmacher Institute annual reports are current only up to 2009 and 2008, respectively. Because the CDC relies on voluntary data provided by the states after the conclusion of the reporting year, this report necessarily lags the slowest of the states in their reporting timetable. Accelerating state reporting would itself be a significant step in potentially shortening the time period before the CDC surveillance summary is compiled and released. Of the states that publish annual reports, as of November2012, only nine had released their reports for 2011. Eighteen states had released reports for 2010, eleven had released reports for 2009, and six more had released reports no more recent than for 2008. Minnesota, Arizona and New York City offer examples of effective reporting that is done in a timely and useful way. Minnesota’s abortion reporting law requires the submission to the legislature and release of an annual summary report for each year no later than July of the following year. Consistent reports that allow review of state trends have been available since adoption of the reporting law in 1998 and the state Department of Health web page is organized for clarity and ease of use. Arizona’s first reporting law became effective in July 2010. It relies on electronic filing of reports, also limiting its cost. The report requires information on abortion occurrence by county, and state officials can make available on request a monthly tally of abortions just 15 days after the end of each month. 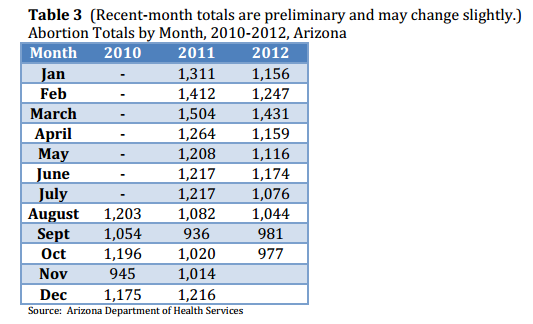 Monthly tallies of abortions in Arizona are available for year-over-year comparison through the month of October 2012 (see Table 3). New York City’s abortion reporting law provides detailed information by zip code, which enabled the Chiaroscuro Foundation of New York to prepare an extraordinary online city map documenting the high abortion rate in the city over time. The Internet offers significant advantages in facilitating the rapid filing of abortion reports and publications of those results at lower costs for the states. Despite this, only a tiny minority (5) of the states utilize Internet reporting to expedite and simplify the process. A detailed examination of provider compliance with abortion reporting laws is beyond the scope of this paper. According to the most recent annual abortion incidence report from the Guttmacher Institute, whose surveys of providers reach many more institutions and individuals than state and federal agencies, the private-sector undercount of all U.S. abortions was estimated to be 3-4 percent in the early 1990s and the undercount is likely to have become “more pronounced” over the last decade. The reasons cited were the growth of non-surgical abortions and the hypothesized reluctance of entities that perform a small number of abortions to identify themselves, even in an industry-originated survey. The percentage of abortions not reported to state agencies and therefore not available for public scrutiny and analysis is certainly multiples higher, not only because of the voluntary policies of major jurisdictions but also because of uneven or poor compliance with even mandatory policies in some states. An investigation by the Chicago Tribune published in June 2011 documented what it termed “many gaps in a surveillance system viewed as crucial to protecting” women. The review found that the number of abortions reported to the state under its 1975 reporting law was between 7,000 and 17,000 fewer per year than the number privately reported to Guttmacher. The number of providers reporting in Illinois was only two-thirds of the 37 providers identified by Guttmacher as operating in the state. Moreover, nearly 4,000 of the state reports for individuals lacked information on complications of abortion. Illinois reported 54,920 abortions to Guttmacher in 2008; complications information, therefore, may be missing in 20-38 percent (4,000 reports missing data plus 7,000-17,000 cases unreported to the state at all) of the abortion cases in the state. Illinois is one of the minority of American states that includes complication reporting on its standard form, and the law allows for criminal penalties on providers who intentionally fail to submit accurate and complete reports. Despite this fact and the absence of so many mandated reports, the state Department of Public Health has never, according to the Tribune, sought disciplinary action against any abortion provider. It is reasonable to hypothesize that those providers with less-qualified or non-qualified personnel are those most likely to experience higher complication rates and avoid reporting. The lack of enforcement of existing reporting laws by public health agencies has been problematic elsewhere as well. Delaware has the highest abortion rate in the nation according to the Guttmacher Institute, higher even than New York State. In 2005, Delaware reported 5,150 abortions to Guttmacher, but the total dramatically increased in 2007 and 2008 – reaching 7,070 in the latter year. But Delaware’s Department of Health and Social Services reported only 4,603 abortions in 2008, a figure 65 percent lower than Guttmacher’s estimate. Guttmacher has reportedly said that the state’s official undercount is due to failure of a single abortion clinic in the state to provide accurate data. Most of the unreported abortions at this facility, which may have been operated by a physician charged with murder in Pennsylvania, were carried out on non-Delaware residents. Delaware’s recent history of having an abortion rate twice the national average and the potential for a high number of women traveling into Delaware from out-of-state for abortions heightens concern about accurate data collection and clinic safety there. Delaware did not furnish data to the CDC for its 2009 report. The undercount of abortions in the District of Columbia is likewise dramatic and of public concern. According to Guttmacher (2008), the District of Columbia experienced sharp declines in total abortions from 2000 onward, falling by more than half from that year (9,800) to 2007 (4,160), a period in which the national abortion volume decreased by roughly 7 percent. In 2009, the last year for which data is available for the District of Columbia, the city’s abortion total surged a stunning 28.7%. It seems probable that an increase of this size did not actually occur, but rather that the numbers reported for the immediately preceding years under the capital city’s voluntary reporting law represent a large undercount. Public funding of elective abortion did resume in the District of Columbia in late 2009, but this occurred late in the year and could not account for the higher total. Other explanations for the increase elude District of Columbia officials. In response to an inquiry for this report, a city official in the Department of Health observed that in the early 2000s “several facilities that provided the Department of Health with abortion [data] either closed or no longer reported data” under the city’s completely voluntary system. The official further stated that an attempt to obtain answers from facilities that perform a “large number of abortions” failed because “there was high staff turnover and no one could fully explain what was going on.” City birth data, she noted, decreased only slightly at the same time. One possibility is that a large proportion of the unexplained decrease in abortions in the 2000s simply represents underreporting and that the increase in 2009 is a reflection of abortion reporters’ perceived or actual comfort zone with a friendly Congress and national administration. The states that make abortion reporting voluntary and do not publish annual public reports are few in number but sizable in terms of the number of abortions involved. For 2008, the most recent year for which the Guttmacher Institute has released the results of its annual private survey, the six states without public reporting (California, Connecticut, Maryland, New Hampshire, New Jersey, and Wyoming) totaled 322,960 of the estimated national total of 1,212,350 abortions – more than one quarter (26.6%) of the entire national count. Inability to access data from these states in a timely and reliable way casts considerable doubt on assertions about general abortion trends in the United States as well as about more particular issues of health, age, abortion safety and demographics of concern to policymakers and the public. Moreover, because reporting is a minimally burdensome responsibility common to medical practices of all types, the lack of government interest in accumulating and publishing significant information can foster a laissez-faire approach to abortion incidence generally. Officials in Maryland responded to a request for this paper by noting that the state had ceased to collect data in 2006 and has published no reports in recent years, citing unreliability of the information they were receiving. State officials suggested that inquiries about abortion in the state be directed to the private Guttmacher Institute. The state ranked fifth highest in its abortion rate in 2008, according to Guttmacher, and in recent years has become an East Coast haven for late-term abortions. Information on the characteristics of women obtaining abortions is relatively uniform among the states (Table 4), and the form recommended by the U.S. Centers for Disease Control reflects a well-developed consensus about the kind of information most useful to policymakers and researchers that can be collected at the time of the abortion. The CDC requests that states provide it with aggregate (not individual) information on the following characteristics of girls and women having abortions: age, ethnicity, race, marital status, number of previous births, number of previous abortions, and maternal residence (state, reporting area, or foreign nation). The CDC acknowledges, however, that the level of detail it “receives on the characteristics of women obtaining abortions varies considerably from year to year and among reporting areas.” This challenge was among the reasons CDC developed a reporting handbook for abortion that was published in 1998, but in the absence of mandated federal data collection the states can develop and have developed their own reporting forms. 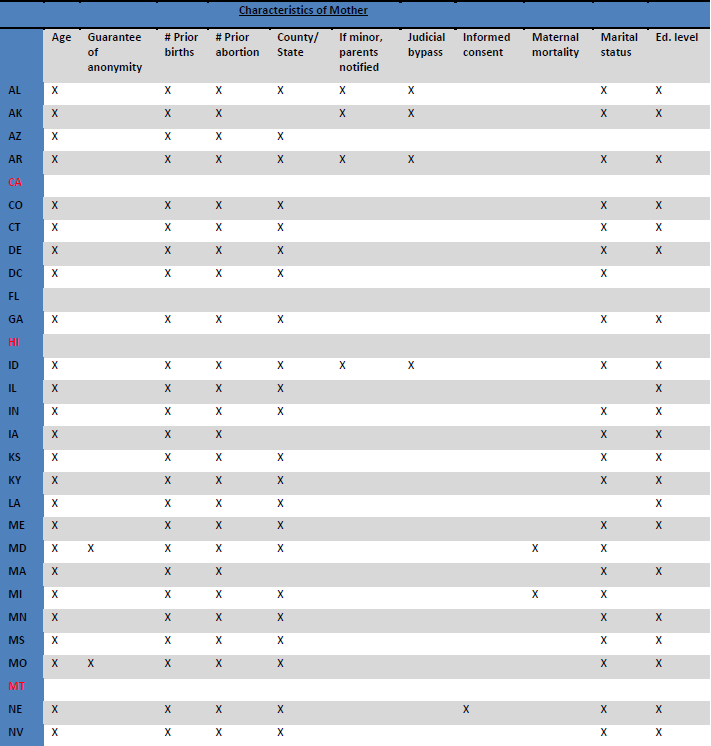 Despite this variation in reporting forms, the number of jurisdictions (states plus the District of Columbia) collecting maternal information is high across several categories (See Table 3): age (41 states), number of prior births (41), prior abortions (40), marital status (38), state of residence (40). Most states capture additional information that CDC does not request for its surveillance summaries: county of residence (40 states) and education level (35). Beyond these categories, states collect relatively little data from abortion providers, in keeping perhaps with ongoing concerns about the privacy of individual medical records. While release of such records is forbidden by law and inhibited by the small number of government officials who have access to them, occasional release of identifying information has occurred in the past due to invasions of privacy by activist organizations. These issues were addressed again recently in Arizona, which adopted an abortion reporting law in 2010 that basically codified the existing regulatory policy of the state Department of Health. One abortion provider recommended that the law permit the reporting entity to omit most if not all of the standard CDC maternal data if the provider reasonably believed that the information could lead to the disclosure of an individual’s identity. The legislature rejected affording providers this high level of discretion and decided instead to maintain the range of data collection, add information about the specific medical justification for the abortion, include harsh penalties for anyone found to have disclosed individual data, and exclude residential information below the county level. Public disclosure of the aggregate information mirrors substantially the aggregate data compiled and published by the CDC from other reporting areas across the country. The 50 states and two smaller jurisdictions covered by this paper, the District of Columbia and New York City, collect a variety of information about characteristics of the pregnancy and the abortion method chosen to end the developing life. Several points are captured by nearly every jurisdiction we examined (see Table 5), including the date of the abortion, the probable gestational age of the developing life, and the abortion method employed by the facility. Other characteristics were less commonly reported and a number of factors of potential policy and research significance were only rarely covered by state laws. For example, just 16 states require information on abortion complications to be included in each report filed with the state and, of these, only eight states publish summary information about abortion complications in their annual report. This data will necessarily have significant limitations given the fact that complications do occur away from the abortion facility and in the absence of follow-up by the abortion facility, but an initial reporting requirement when a complication occurs and is known to the facility is sensible. Viability, the ability of the child to live outside the womb on its own albeit with artificial assistance, is also an area in which state reporting laws require very little. Only six of the 50 states ask about the pathological evidence of the extrauterine survival potential of the unborn child when a late-term abortion has been performed. These states are Indiana, Kansas, Louisiana, Utah, Missouri and Nebraska. Only five states – Florida, Indiana, Kansas, Nebraska, and Oklahoma – inquire about the medical reason for the abortion if, in fact, the child was found to be viable. In at least two other states, Illinois and Massachusetts, fetal viability data is not requested on the reporting forms despite laws requiring the collection and reporting of such data for at least some abortions. Informed consent, maternal mortality, and follow-up care are also areas in which state reporting exists but is very spare. While informed consent laws for abortion are commonplace nationwide, only seven states (Idaho, Nebraska, Oklahoma, South Carolina, South Dakota, Utah, and West Virginia) inquire on their standard reporting form whether informed consent was obtained before the abortion procedure was carried out. Only Texas, Maryland, Michigan and Utah inquire about maternal mortality from abortion. The definition of maternal mortality includes factors related to pregnancy and childbirth where the death occurs up to a year after the maternal event, and thus would include a number of deaths that would not be associated in public records with induced abortions due to a lack of information and a variety of terminological issues . Researchers who have conducted reviews of maternal mortality statistics using records-linkage methods have uncovered more deaths than reported in the Centers for Disease Control’s surveillance system. The CDC itself acknowledged these problems in 1986 in a published paper on maternal mortality and there appears to have been little progress in resolving these issues. Follow-up care is an exceedingly rare topic in state abortion reporting. Only Oregon inquires about whether a follow-up visit was recommended and whether the visit took place and where it took place (i.e., in the facility, at a hospital, or in a doctor’s office). With the increase in drug-induced abortions (Arizona, for example, reports a 25.7 percent increase in non-surgical abortions from 2008 to 2009 and Delaware reports that non-surgical abortions have risen from 2.1 percent of abortions in 1997 to 18.4 percent in 2007), follow-up visits are more important than ever to ensure that the pregnancy has ended and a surgical abortion is not needed. Use of mifepristone now stands behind only suction curettage as the most common or preferred method of abortion in the United States. Finally, state abortion reports reveal very little information about minor children’s recourse to abortion and whether or not in these cases parental notice was given or the abortion facility assisted the minor in obtaining a judicial bypass. Under current court rulings states that have adopted parental notice or consent laws must provide a method whereby the minor and clinic personnel or other adults can obtain a judge’s ruling whether or not she is mature enough to consent to an abortion without parental knowledge or permission. Knowing how often parents are notified in these instances and what percentage of cases involve judicial bypasses might be valuable to policymakers wishing to evaluate the operation of such laws and how often they result in parental consultation in the abortion decision. Only nine states have abortion reporting forms that ask about parental notification and judicial bypass utilization. 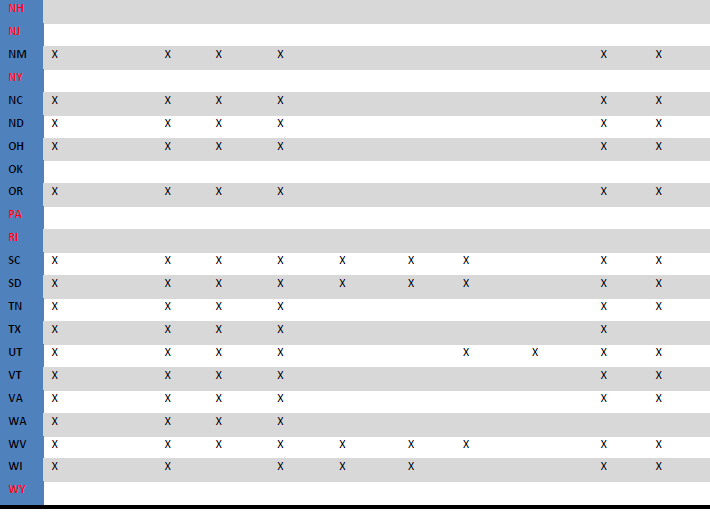 States also gather a variety of data on abortion providers (see Table 6) as they seek accurate information about where abortions are taking place and who is performing them. The vast majority of states require that the facility where the abortion is performed be identified, or at the very least they ask for the facility’s identification code. However, this is not an explicit standard for every state and certain states, such as New Mexico, do not require it. Should women encounter a pattern of problems at a particular facility with complications such as infection, bleeding, perforation of the uterus, or gastrointestinal pain following abortion, it would be beneficial that the facility be identified so that the problem could be addressed in order to better safeguard women’s health. Similarly, it would be constructive for states to pinpoint the types of facilities where abortions are being performed. Seven states listed in Table 5 require that the type of facility (such as clinic, hospital, doctor’s office, etc.) be noted. Access to this information would assist in determining what sort of facilities women are going to in order to obtain an abortion and what access they have to proper medical care during and after the procedure. Additionally, this information would help determine where the best possible care is taking place with fewer complications, better follow-up care, and better access to informational and counseling services. While the patients always remain anonymous, several states require information regarding the person who is performing the abortion. They ask for their name, or at least their provider identification code, and require that they sign off on the report. A handful of states are particularly thorough (South Dakota requests not only the name of the abortion provider but also his or her license number, specialty, and any professional sanctions). Collection of this information would be valuable to ensure that women are receiving the best and safest care possible from licensed physicians and that the information that is being reported is confirmed by the doctor. The public interest in the characteristics of women and girls obtaining abortions, in the record of physicians and other personnel performing them, and in the nature of the developing child and the reasons for and means of its destruction is a compelling reason for gathering complete and consistent data about abortion. Moreover, there exist a strong public interest in and consensus about making abortion a rare event regardless of its legal status in the nation. The only appropriate way to gather and assess this information is through public health agencies that impartially reflect this public interest, do not serve the policy objectives of any private participant in debates over abortion, and can act with public accountability to amass objective data while protecting both patient privacy and individual health. In the four decades since Roe v. Wade delivered a shock to the nation’s legal system regarding elective abortion, states have responded with a variety of means, some carefully considered and thorough, others passive and nearly neglectful, to the need for accurate information about abortion. The resulting situation, a slowly produced and voluntary national report from the CDC, a similarly delayed but more comprehensive report from a private entity associated with legal abortion, and a patchwork of state laws and policies, denies citizens, researchers and policymakers the advantages of prompt and thorough information that could guide debate and action toward the best possible outcome for mothers and the children they help beget and bear. More consistency among state laws is an overall goal worthy of support, as is the objective of ensuring that abortion information is gathered and made available in annual statistical reports in the small number of states, with high abortion volumes, that now make no public reports at all. Beyond these recommendations in principle, the following steps, relatively low-cost and well-modeled by states and locales conducting effective reporting, could make a dramatic difference in what Americans know about abortion and the progress being made, or not being made, in reducing this practice in our nation. Congress should direct and fund the Centers for Disease Control to contract with each of the 50 states and U.S. territories to gather data for a national abortion report to upgrade the Surveillance Summaries issued now. The current voluntary reporting form could be substantially retained to ease the administrative burden of a new national reporting scheme and allow comparison of data year over year. The data CDC collects under this system, which would take up anew the initiative abandoned by the National Center for Health Statistics in 1993, would neither replace the state reports nor obviate the additional data states have chosen and will choose to collect regarding abortion within their jurisdictions. Congress should also stipulate that the national report appear within one calendar year from December 31 of the year being tabulated and provide adequate funds to assure this result. Each state should be encouraged to adopt the goal of publishing aggregate statistical data on abortion on a timely basis, including a monthly “flash” report and an annual report that is released no later than six months after the close of the previous calendar year. The monthly report could be as straightforward as a table of total abortions by county that is released within weeks of the end of the month. Publication of this data could greatly assist policymakers and private sector actors as they devise, test and evaluate education and public health strategies for making abortion less common and ultimately rare. Annual reports with greater detail can be produced, as the state of Minnesota has consistently shown, within a reasonable time frame after the year in which the abortions occurred. By July 1 of the following year, each of the 50 states and the District of Columbia should publish an annual report for the preceding year. An Internet-based system for gathering data can sharply reduce the cost of this data collection and publication. Weak compliance with abortion reporting laws is a continuing problem that has vitiated the accuracy of abortion reports in many states, even to the point of persuading public officials in Maryland and the District of Columbia to discount the utility of the reports or cease collecting them altogether. Among the states, only Michigan includes on its abortion reporting form a notice to the effect that failure to provide the required information is a misdemeanor punishable by imprisonment of not more than one year or a fine of not more than $1,000, or both. Congress has the authority to direct the District of Columbia to conduct thorough and timely abortion reporting and to provide the funds necessary to complete and publish a useful report on an annual basis. The frequency of changes in abortion clinic personnel does not justify failure to comply with abortion reporting requirements. The collapse of abortion reporting in a state like Maryland should preferably be redressed by the General Assembly in the exercise of its public responsibility. Congressional support for a national reporting system worthy of the name could provide incentive for states with dismal records to participate in accumulating more information. If necessary, however, Congress could impose reasonable financial disincentives on the handful of states that willfully fail to accumulate such vital statistics. Finally, abortions involving minors and the operation of parental notice laws deserve more attention. Only eight states collect information on whether a judicial bypass was sought for a minor child requesting an abortion when that minor is unwilling or unable to notify a parent or obtain parental consent for the abortion to be performed. Advocates of parental notification laws have generally presumed that notice or consent would not be routinely waived through any “rubber-stamp” process of judicial bypass that does not take into account the importance of parental involvement in minors’ health care decisions. Abortion providers state that parental consultation is encouraged and often obtained, but there is a lack of data to substantiate this observation. All 50 states and the District of Columbia should require abortion clinics in their jurisdictions to report on the number of legal minors seeking abortions without parental notice or consent, the number who obtain judicial bypasses (where such statutes exist), and the number who inform their parents or are accompanied by them to the abortion. Improving national abortion data collection in the United States should be a priority concern for state and federal policymakers in the years ahead. Experience has demonstrated that more thorough and more swiftly produced information can be obtained and published at lower cost and with full protection of individual privacy. Swifter and more accurate data can facilitate information campaigns of all kinds that pursue the goal of reducing abortion and ultimately making it rare in the United States, assisting policymakers in adopting the best approaches that protect both women and the children they carry. “Induced Abortions in Minnesota January-December 2011: Report to the Legislature, July 2012,” Minnesota Department of Health, at http://www.health.state.mn.us/divs/chs/abrpt/abrpt.html (viewed December 4, 2012) The report is published in accord with MN Statutes, 145.4131 – 145.4136. Speaking in Steubenville, Ohio, in February 2008 on behalf of the presidential candidacy of his wife Hillary Clinton, former President Clinton reiterated remarks first made in 1992 and said, “”Even though she as a woman did not believe we should overturn Roe v. Wade, she said – and she said again at the outset of this election – that every abortion is a tragedy and they should be more rare, but safe and legal. And I agree with her.” Aaron Lewis, “Bill Clinton Responds to Anti-Abortion Rights Activists,” CBS News Politics, February 18, 2008, at http://www.cbsnews.com/8301-502443_162-3842338-502443.html. See also Suzanne Malveau, “Obama questioned on abortion, why he is a Christian,” CNN Politics, September 28, 2010, at http://articles.cnn.com/2010-09-28/politics/obama.tough.question_1_late-term-abortion-abortion-debate-president-barack-obama?_s=PM:POLITICS (viewed December 27, 2011). By “flash report” the authors mean preliminary data on abortion volume by county or other reasonable governmental unit that can be compiled and released on a monthly basis to yield a look at short-term trends. The report would not substitute for the annual, detailed reports that most states compile that look at the many maternal and other factors discussed in this paper. Robert Goldenkoff, Director, Strategic Issues, U.S. Government Accountability Office, Testimony before the Subcommittee on Federal Financial Management, Government Information, Federal Services, and International Security, Committee on Homeland Security and Governmental Affairs, U.S. Senate (September 23, 2008) at http://www.gao.gov/assets/130/121237.html (April 18, 2012). Henshaw, SK, Abortion Services in the United States, 1995-96 Family Planning Perspectives; in Saul, Rebekah, Abortion Reporting in the United States: An Examination of the Federal-State Partnership, Special Report, Family Planning Perspectives, Vol. 30, No. 5, September/October 1998, 244-47. Naturally, with variations in the data regarding total abortions as large as they are, substantial differences between other factors collected by the CDC and Guttmacher also occur. For 2008, for example, CDC found that 14.6% of abortions were carried out by non-surgical means while Guttmacher registered a higher percentage – at 17. The CDC undercount of the percentage of non-surgical abortions is at least 14% for this important indicator. The collection of detailed data on marriage and divorce was suspended at the national level in 1996, for some of the same reasons cited apropros abortion (budgetary concerns and limitations on the quality and comparability of the state data). See the National Center for Health Statistics comment at http://www.cdc.gov/nchs/mardiv.htm (May 2, 2012). The New York City Department of Health and Mental Hygiene maintains its own detailed data on abortions occurring within city limits and publishes it as a subset of its annual report on vital statistics. See http://www.nyc.gov/html/doh/html/vs/vs.shtml (May 15, 2012). States that did not provide copies of their abortion reporting forms are listed in the tables as such but not included in tallies for particular report characteristics. For this reason, there is some discrepancy in numbers between this report and other published summaries, though this is not a result of inaccuracy in the information presented. The Lozier Institute continues to seek copies of state abortion forms and will update this report as they are received. Jones, Rachel K, and Kooistra, Kathryn, “Abortion Incidence and Access to Services 2008,” Perspectives on Sexual and Reproductive Health 2011: 43(1):41-50. Guttmacher Institute (Washington, D.C.). This is the successor publication to the journal Family Planning Perspectives. Wyoming, with the nation’s lowest abortion rate at 0.9 per 1,000 women age 15-44 (Guttmacher 2008), does not publish an annual abortion report. Annmarie Timmins, “House holds senate bills as a ‘price’: GOP in conflict across chambers,” Concord Monitor, April 26, 2012, at http://www.concordmonitor.com/article/325990/house-holds-senate-bills-as-price?CSAuthResp=1335980228%3Ajdme524b90trbp8cu2mthah633%3ACSUserId%7CCSGroupId%3Aapproved%3A07DA8441CD5FB94CAE0FCCD7F41D4BEF&CSUserId=94&CSGroupId=1 (May 2, 2012). See http://www.nyc41percent.com/ (May 2, 2012). Jones, Rebekah K. and Kooistra, Kathryn, op. cit. Megan Twohey, “State abortion records full of gaps: Thousands of procedures not reported to health department,” Chicago Tribune, June 16, 2011 at http://articles.chicagotribune.com/2011-06-16/news/ct-met-abortion-reporting-20110615_1_abortion-providers-fewer-abortions-national-abortion-federation (April 20, 2012). Deneux-Tharaux, et al., “Under-reporting of Pregnancy-Related Mortality in the United States and Europe,“ Obstetrics and Gynecology, Vol. 106, No. 4, 684-92, October 2005. Jones, Rebekah, K, and Kooistra, Kathryn, op cit. Steven Ertelt, “Gosnell Abortion Center May Have Faked Delaware Abortion Report,” LifeNews.com, February 4, 2011; at http://www.lifenews.com/2011/02/04/gosnell-abortion-ctr-may-have-faked-delaware-abortion-report/ (April 20, 2012). Joe Danielewicz, “Maryland drops charges against doctors over late-term abortions,” Reuters, March 7, 2012 at http://www.reuters.com/article/2012/03/08/us-abortion-maryland-idUSTRE82626720120308 (April 23, 2012). Karen Pazol, PhD, et al., “Abortion Surveillance – United States, 2008” Surveillance Summaries, November 25, 2011 (Centers for Disease Control and Prevention); at http://www.cdc.gov/mmwr/preview/mmwrhtml/ss6015a1.htm?s_cid=ss6015a1_w (April 30, 2012). States that require abortion complication reporting are (states that include this information in their annual reports are shown in bold): Arizona, Georgia, Idaho, Illinois, Indiana, Louisiana, Massachusetts, Minnesota, Michigan, Nebraska, North Dakota, Ohio, Oregon, Utah, Washington and Wisconsin. Donna J. Harrison, M.D., “Removing the Roadblocks from Achieving MDG5 by Improving the Data on Maternal Mortality: How Faulty Definitions of ‘Abortion,’ ‘Safe Abortion,’ and ‘Unsafe Abortion’ in Reproductive Health Indicators for Global Monitoring Lead to Miscalculating the Causes of Maternal Mortality.” International Organizations Research Group Briefing Paper No. 5, May 1, 2009; at http://www.c-fam.org/docLib/20090514_Removing_the_Roadblocksfinal.pdf (April 23, 2012). Alabama, Alaska, Arkansas, Idaho, Oklahoma, South Carolina, South Dakota, West Virginia and Wisconsin.